This one’s pretty basic. Knowing which Keepers go together and which ones don’t is vital when that Keeper Limit card gets played. For example, a common mistake is thinking that War and Peace go together, and retaining them both, when it would usually be better to toss the War card in hopes of winning with Peace, no War. Of course, if that goal recently hit the discard pile, you might want to discard them both in order to keep more promising Keepers. The wacky and seemingly random game of Fluxx can frustrate, flummox, frazzle and fricassee the most strategic minded players. Let’s face it its a roller-coaster of a card game where you can hold all the cards (literally) and the next moment, be empty handed. Lots of players ask simply “where is the strategy in a game with ever changing rules and goals?” Ah the answer is in the cards.. 5 cards to be precise. There is no random factor involved when you play this card. In many card games, cards that reverse play direction or allow a player to play again immediately set that player up for a improved opportunity to accomplish the goal. It’s a rule breaker – and in this game of changing rules it the one that only you get to do. These are the only two Goals in the game that require that a player only have one Keeper in front of them to win. Sure, they have two conditions but (For example – Peace (No War) says: If no one has War on the table, then the player with Peace on the table wins.” The only card you need is Peace. Keep it in hand as best you can then wait for the opportunity to play it when War is trashed) This Goal is much easier than trying to collect two Keepers AND the Goal that matches them. Again, no random game play here. You can simply take a Keeper from another player, and give them one of yours. Since the card allows you to choose the Keeper, it quite powerful in that you can get exactly the card you need to meet the Goal. (as long as you have the other Keeper you need – or in the case of numbers 3 and 4 above, it could be the ONLY Keeper you need. Boom! No questions asked. Need some Chocolate for your Milk? You got it. Need Bread for your Toaster. It’s yours. If you get this card, dont just play it any old time. Form a strategy in your hand with a Goal and a Keeper, utilize the other Goals and Actions above then Ba Da Bing, Ba Da Boom. You win. PS. There are no “New Rules Cards” that qualify for this category. These cards are the “winds of change” that constantly blow in the game of Fluxx. You have to survive them, or use them to your advantage. Timing is everything. But if you recognize the 5 Power cards listed above and their value, it makes those ever changing winds calm down a bit. New Rule Card Strategy #1: If you hold a New Rule Card in hand that would hurt you directly, hold and wait. New Rule Card Strategy #2: Don’t play a new Rule card unless its effects benefit you more than it benefits other players. It may sound basic, but weigh the consequences of slapping down a New Rule. Since its effects are immediate, you get to experience the effect first. If the other players will benefit from this more than you.. hold the New Rule Card until you have a better game play situation. New Rule Card Strategy #3: Because New Rules effects are immediate, and they affect you first there are several cards that are powerful and allow you to gain a significant advantage when played – again IF played at the right time. These are Draw 5, Draw 4, Draw 3, Play All, Play 4, and Play 3. The “Draw” cards, when played at the right time, can get you the cards in hand to win the game, and you draw them immediately, minus the number of cards you already drew this turn. (Example: the rules are Draw 2 Play 2. Playing Draw 5 immediately get you 3 more cards.) This is simple hand advantage. But again wait until you are close to meeting a goal, or need only one Keeper to win. If you can combine these Draw and Play cards, then you really gain the upper hand, getting cards in your hand for a potential win and then playing them all in the same turn. Now there are lots of winning combinations. (That’s what makes Fluxx so… ok… Fluxx-tastic!) but these are some very basic strategies, that if you keep them in mind will give you a bit of confidence and direction in the game. Just bear in mind with any New Rule Card – Timing is everything! There’s a ton of randomness in Fluxx, but there’s still room for a bit of strategy. Remember that rules take effect immediately, and supersede other rules of the same type. Have a Play 2 card? Keep it until you also have a Play 5. Put down a Play 5, play out your hand, and finish with a play 2. Or a rules reset. Or anything else that makes other players sad. You got to do several interesting things, they new get to do very little, which is much better than simply randomly changing the play number as you go. Pay close attention to the actual language of every card. Sometimes the ‘if/then’ can seem to say one thing, but the meaning will be fundamentally altered by a ‘rule’ in play. If you’re on top of it, you can use this to your advantage. This is particularly true of cards that allow you to play more than one at a time. The order you play the cards is also EQUALLY important. Work it all out in your head before you start throwing down ‘rules’ and ‘actions’. If ever there are 5 minutes to kill, or 20, or an hour, this game is perfect filler. I keep the deck in my glove compartment, and have had the opportunity to bring it out immediately when the dreaded boredom sets in. Whether it’s waiting at a movie theatre or in a line of any kind, the amount of concentration needed for this is almost nil – lovely! One of the things that my friends and I like to do with this game is to mix in cards that were removed from one edition to the next or stuff from other variations. The “X = X + 1” new rule card is a great example of this because it’s a fun card and doesn’t make it any more or less difficult for a game to end. Obviously, new rule and action cards are the way to go when doing this as keepers and goals become less likely to turn up the more cards you add – best not to add things that slow down how quickly you’ll get through the deck and how likely the goals and keepers will be relevant. only effect you on your turn. So, chat away. the social times around the table than it is about the game. My friends and I have played this game a lot and we came up with a card that we feel fit the feeling of the game and was just fun to use. We called the card Socialism, but feel free to rename it whatever you please. It’s a fun way to hit the reset button without watching everything get dumped to the discard pile like with Rules Reset. Give it a try. When players see you going towards a goal, they will try to stop you. And it’s as easy as replacing the goal. So play keepers to meet a goal in your hand, and play your keeper when it will give you the win. This game absolutely thrives on player interaction. My best games have always been ones where the point is to see how much you can mess with everyone rather than just trying to win. 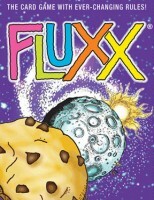 Trying to always win at Fluxx is like trying to be the first one finished at a gourmet dinner – you’re missing the point. If the number of plays permited per turn is low, and you have all the cards you need to win, play the keepers first and then play the goal last. It is easier for other players to get rid of your goal than to get rid of your keepers. When it is your turn, if you can win then do so. game in a defensive manner. – When you see goals that have keepers in play, change it. – If a Goal has at least one keeper in the trash, keep it. . . haven’t been played since the shuffle/deal, steal/trade them. . . you’re not being forced to play it.